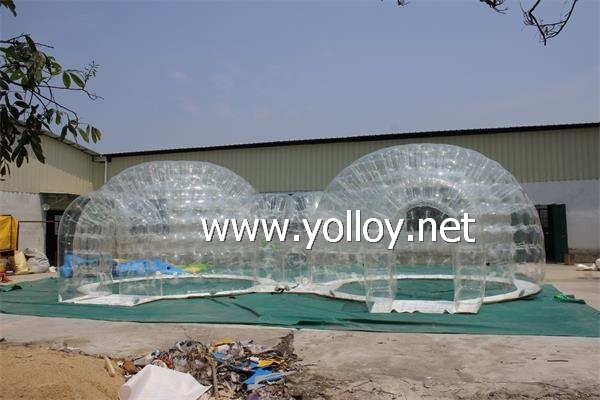 we haIt's double layer, air sealed dome tent, so no need to use blower to keep inflating. and it's totally water proof. Led Lighting can be assemble with the tent too. it's also a very good idea to use it as snow globe decoration. see what a fantastic site with the clear dome tent. we can make the dome tent size from 5m to 10meter, as if client need large dome for different activity, our person can make a design for your ref. this dome tent is very easy to set up by 2~3 person, after it set up, it should be anchord by water bag or sand bag so to avoid it blow away easily by wind. as if any punch of the dome, client can use the repair material to fix it easily. as if it used for indoor activity, it can also attached a groundsheet in the bottom. more details please contact us freely if you are in need of any similar product.